Over the years since I've been taking an interest in GT6s one topic that has come up regularly is around the occasional rear seat that was available as a factory accessory or GT6s. There has been a renewed interest on this topic recently with discus-ions on various Triumph web forums and Facebook groups. This is as a result of an unused NOS (new old stock) seat kit complete with all fittings, instructions and packaging coming up on ebay recently. In auction it reached an amazing £604 proving that there is quite a demand for these kits amongst GT6 owners. Also a second brand new kit came to light on the Triumph GT6 Facebook group shortly afterwards. I was lucky enough to find a similar complete seat kit for my own MK2 GT6 the TSSC International back in 1988, it vas also a boxed brand new kit complete with the fittings and I paid £75 for it which I reckon was a bargain, especially when you consider that I had never seen another new kit for sale until the recent ebay auction. Officially the factory only sold the kits for GT6 MK2 and MK3 models but the early GT6 Mk2 versions can be fitted to MKls. There are early and late version of the kit for the MK2s, the early version having a different mounting arrangement due to the longer luggage deck fitted before commission number KC75031. This included a sturdy horizontal support bar. The early version is the one that can be made to fit MK1 cars and is upholstered in smooth fluted vinyl (or leather). 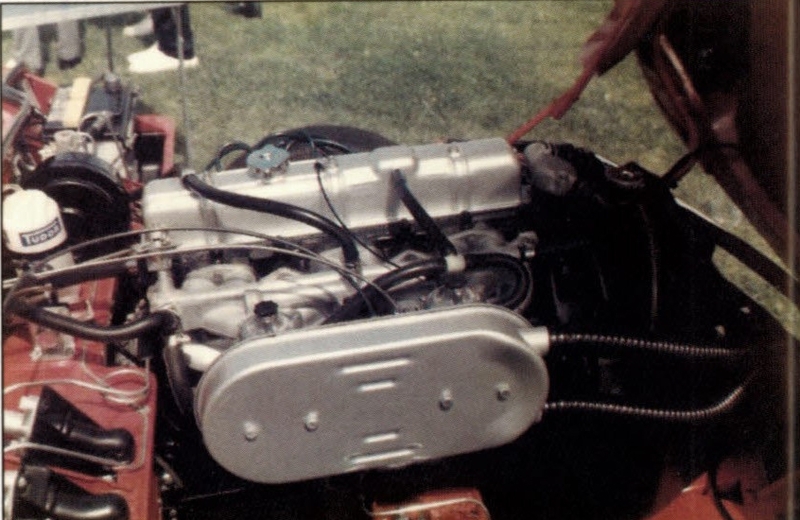 The later version made for cars of commission number KC75031 had the later basket weave type upholstery and was essentially the same as the version for early MK3 cars. This kit used the existing horizontal support bar at the front of the rear luggage deck boards. Kits were available in a range of colours and also available in leather to fit cars fitted with optional leather seats although this is a pretty rare option on an original GT6. 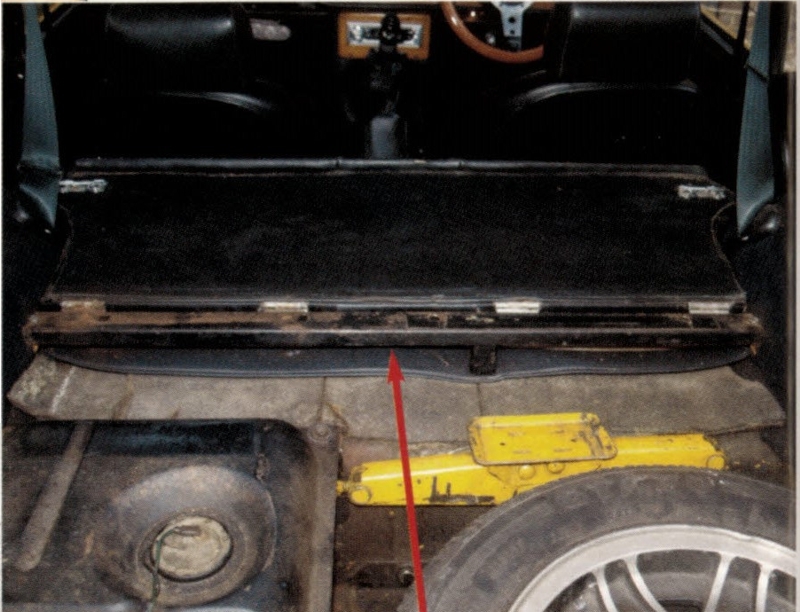 to a horizontal support bar to allow it to be lowered to provide extended luggage space (like an estate car). There are brackets that hold the seat in an upright position using a pretty basic shoot bolt arrangement. There are also brackets to support the seat when in a folded position. On the early cars the front board of the luggage deck has to be discarded and the kit comes complete with a shorter board and boot floor carpet to fit the shorter luggage area. 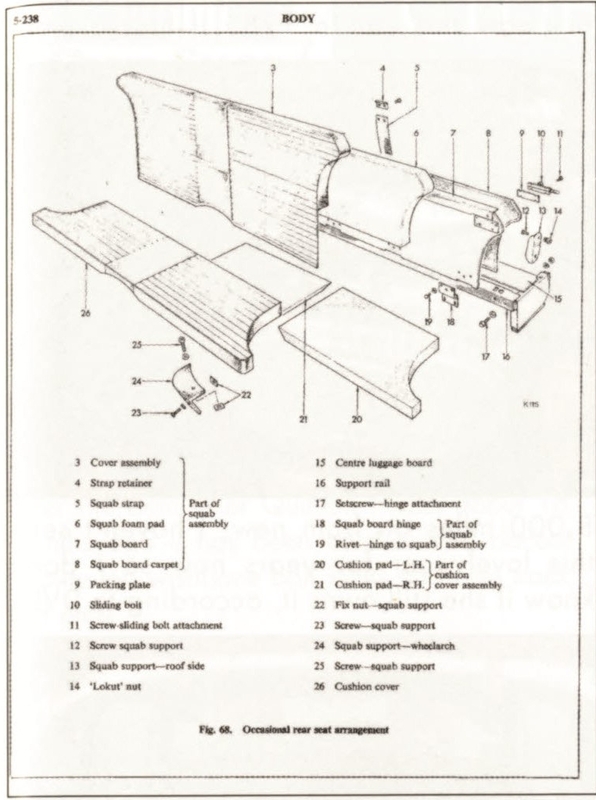 I fitted the kit from scratch to my car 25 years ago, although I don't have the instructions anymore I do remember quite a bit of the procedure of fitting it so I'll describe this. Strangely the factory workshop manual doesn't seem to have a section on the later seat kits but does cover the earlier ones. 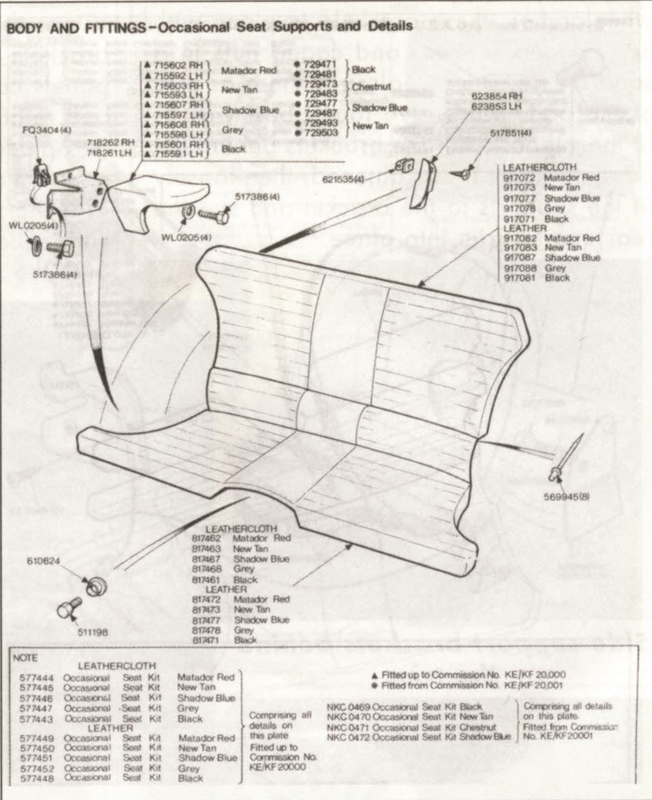 The following picture from the parts catalogue shows the arrangement. The rear horizontal support car at the front of the luggage area has to be removed first (after taking out the luggage area carpet and boards). The trim strip at the front of the support bar is removed (held in place by 4 nuts). The Seat squab hinge is then pop riveted to the horizontal support bar using 8 pop rivets that are supplied in the kit. The two rear quarter trim panels need to be removed to access the mountings for the side support brackets. 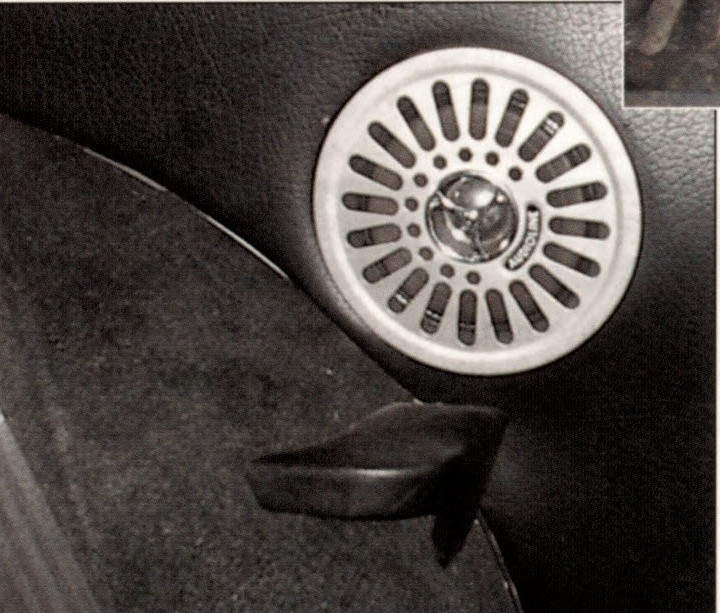 There are two little cutaways in the board behind the vinyl foam on each side on the wheel arch curve if you have original type rear quarter trims. The vinyl and foam (including the beading) has to be trimmed around the cutaways (this allows access for the bolts for the side supports). There are steel brackets that need to be bolted in place in the cavity behind the rear trim panels just above the front of the wheel arches, these are held in place with hex headed screws and caged nuts in a square hole which is already there as part the body work. I've found best way to the support is fit the brackets behind the panel in place fully tightened, then loosely the supports to the bracket and slot the rear quarter trim into place. There are 2 more caged nuts that fit behind the squab/shoot bolt retaining brackets on each side, again the bodywork already has square holes in ace to accept these. The headlining needs to be pierced to allow the mounting screw to access the upper of the caged nuts. 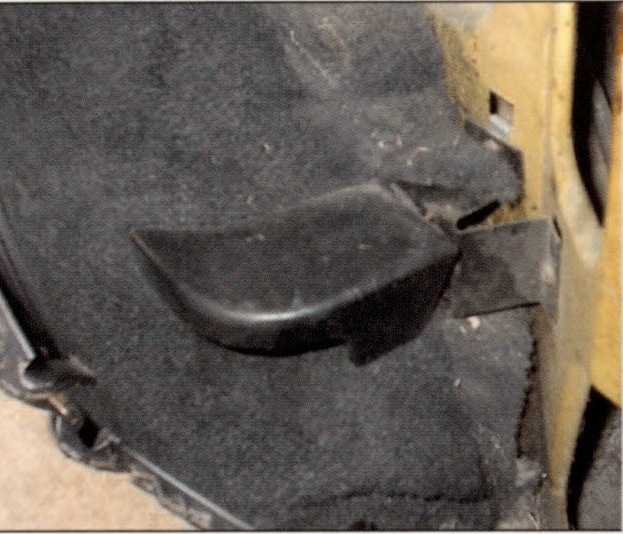 The rear quarter trim panels have a hole the board behind the vinyl and foam in the right place for the bolt to access the lower caged nut, the vinyl and foam needs to be pierced to allow access. Once the caged nuts and al side support brackets are all fitted the rear quarter trim panels can be replaced. The squab/shoot bolt retaining brackets can then be bolted into place through the trim panels into the caged nuts. The horizontal support bracket complete with squab can then be bolted into place and the rear luggage deck boards and carpet replaced. From experience this is easiest to do with the seat in the folded down position. 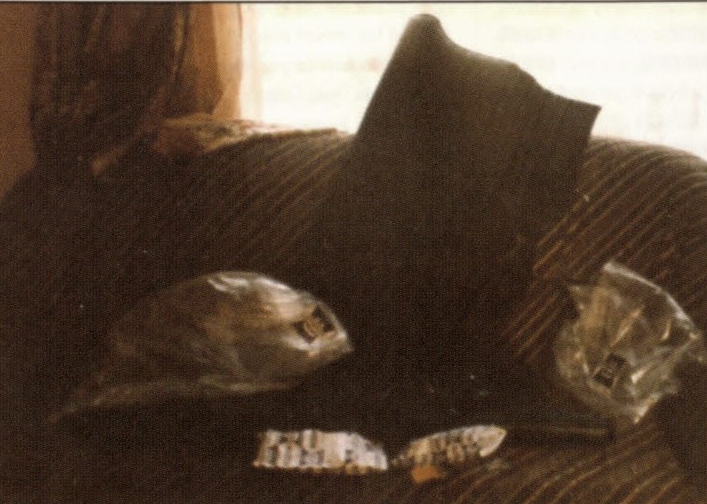 The cushion can then be placed on the shelf behind the front seats. Most kits have a retaining strap with a pop stud that is fitted below the cushion to hold the seat in the folded down position. My kit didn't have this facility. 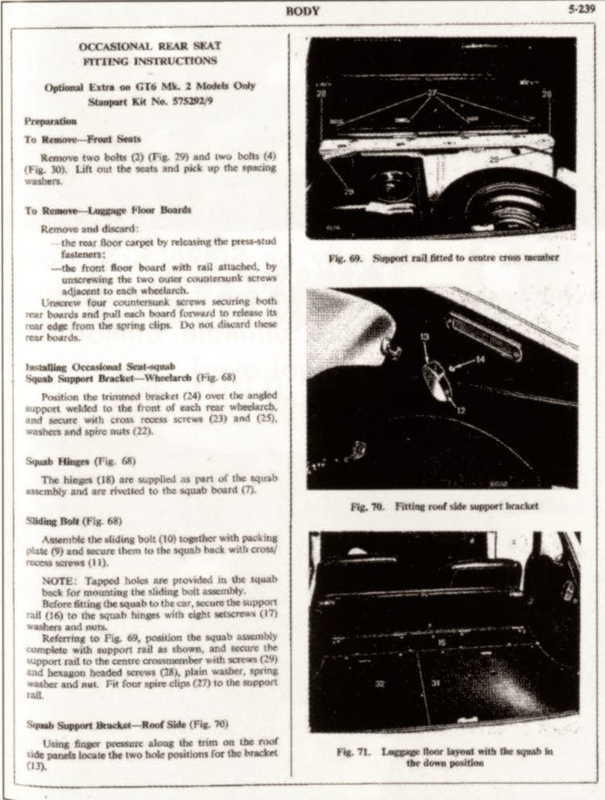 Fitment to earlier cars is covered by the Triumph factory workshop manual as extracts show. It has to be said that the practicality of the seat is pretty limited. There is not really any leg room between the rear seat and the front seats so ideally the passenger needs to sit sideways on. If the passenger(s) are very small children then it's just about possible for them to sit normally I have seen one GT6 owner's car that has seat belts fitted for this purpose that he has rigged up himself but the standard factory arrangement has no provision for seatbelts. 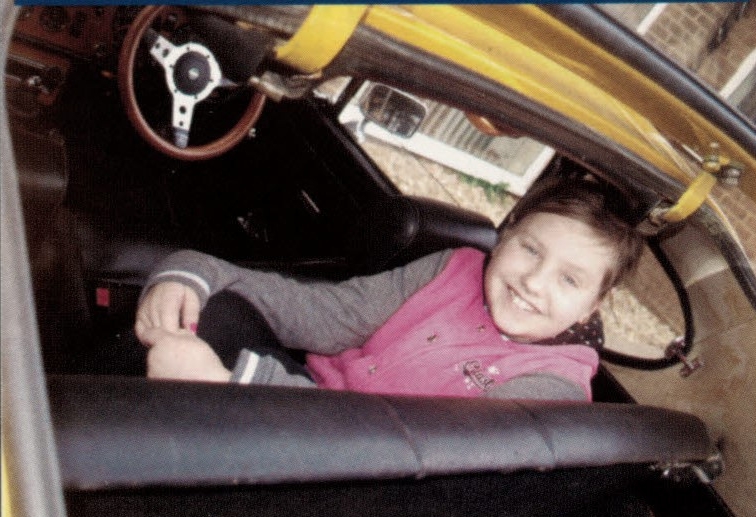 As soon as your kids start to grow it's strictly a 1 child seat sitting sideways as per the pictures below of Alice and no sensible way of fitting a seatbelt. It's therefore very much an "occasional" rear seat. The seat does however finish off the interior stylishly and provides a full barrier to prevent luggage flying ward from the boot area on hard braking. Now some interesting news regarding the availability of seat kits. Richard Briscoe of RB Mobile Classics has picked up on the interest and is looking to remanufacture and sell both complete seats and separate fitting kits for both early and late models. He hopes to have a sample available at the Donington TriumFest in July. Best of luck with this business venture Richard! I also think it's a good plan to sell separate fitting kits as I know there are quite a few owners who have picked up 2nd hand rear seats in the past minus the brackets and without these it's pretty difficult to fit the seat. 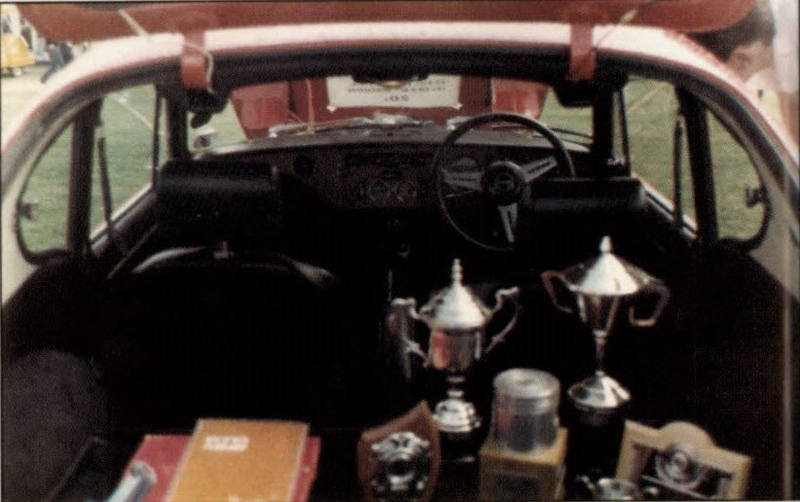 This month's pictures from my archives are from 1985 taken at the TSSC Birthday Barbeque at Shelford Rugby club and feature a Red GT6 MK3 PUO716M that was an excellent low mileage concours car and used to win top prize at many a show back in the day. 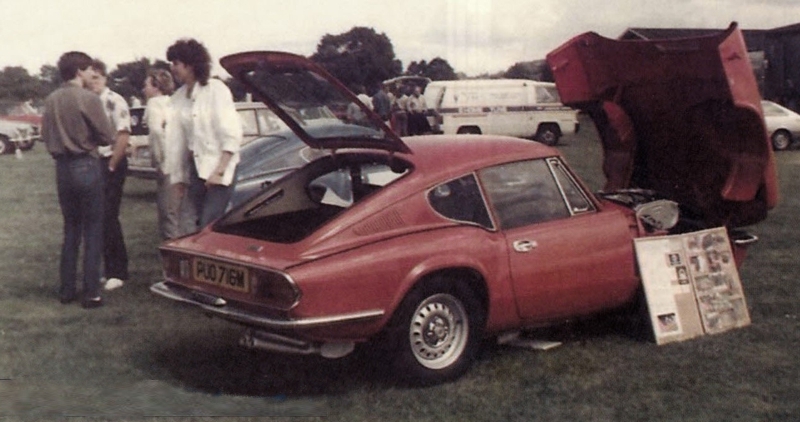 At the time the car was owned by TSSC member Sharon Espin (pictured standing nearest to the car in the photo). When I first saw this car in 1985 it had a mere 8,000 miles on from new. I haven't seen this lovely car for years now so I don't know if she still owns it, according to DVLA records it's currently on SORN so I don't even know if it is still in use but at the time it was certainly the ultimate unmodified GT6 and a car to drool over!